other information Legacy International CD 308, n.d. This CD reissue - perhaps unauthorized? - is presented as by anonymous musicians, under the generic title "Irish Traditional Fiddle Music. Reel, Jigs and Polkas / Cieli [sic] Band Music." 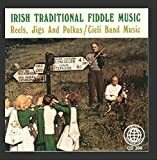 But my research using various library records and the page <http://www.kilfenoraceiliband.com/history.htm> confirms that this is actually the Kilfenora Ceili Band's 1974 album, originally published by EMI and in the US by Everest. Based on an email from John Lynch, originally from Kilfenora, on 2 November 2017, this album "was the one recorded in 1974 by Transatlantic. It was produced by Mick Maloney [Moloney, presumably?] and was recorded in The West County Hotel Ennis Co Clare." John also reports that their album, "Clare Céilí," was recorded in 1973, which means this was their third album, after Clare Céilí.